Generic drugs account for almost 85% of the four billion prescriptions written in the United States in 2012. They are comparable in terms of the active component to their corresponding branded drug but may differ in name, package, shape, color, taste and inactive ingredients. While generic drugs play a substantial role in modern day healthcare and healthcare cost savings, they are often not well understood by patients, prescribers and pharmacists. Consequently, this book outlines the history of genericization, FDA and EMA requirements for generic drug entry, a comparison of generic and branded drugs, a discussion of generic ophthalmic drugs, and perceptions regarding the clinical use and acceptance of generic drugs among the patients, prescribers and pharmacists. The purpose of this book is to give all parties a better understanding of modern generic drug use. Generic drugs are currently being promoted globally as substitutes for brand-name drugs. The substitution may be generated from the medical provider, the patient, the pharmacist, and/or the thirdparty payer. The appeal for the substitution is generally the cost. Generic drugs are often substantially cheaper than the brand-name drug, thus incurring a cost savings to the payer, patient, and the healthcare system. Although the drugs are expected to be equal with respect to effect, efficacy, quality, and safety, they may differ in name, package, shape, color, and taste. This substitution can often occur unbeknownst to the health provider and/or the patient. Given that the understanding and knowledge base differs by each party involved, whether it is the prescriber, payer, and/or patient, the perceived benefits and risks may also differ. The end results are very different perspectives and opinions. Generic drug manufacturing is a multibillion-dollar industry with sales of over $80 billion in 2011 which is $5.6 billion more than the previous year. Generic drugs account for almost 80% of the four million prescriptions written in the United States in 2011. Generic drugs are comparable in terms of the active component to their corresponding branded drug, but are produced and distributed without patent protection. Many of the drugs in the U.S. Food and Drug Administration's (FDA) Orange Book, a book which lists drugs that have been approved by the FDA with respect to safety and efficacy, have generic counterparts. Generic drug development reduces medication prices by increasing competition. Following the entry of a generic drug, a branded drug loses about 50% of its market share after three months and 80% after one year on average. A study by the Congressional Budget Office estimated that generic drugs saved consumers $8-10 billion in one year. Thus, generic drugs play a significant role in the pharmaceutical industry. The creation of branded innovator drugs is necessary for the generic drug market to exist. In 1994, the Uruguay Round Agreements Act was signed into law and set the patent term of a novel drug to 20 years after the first date of filing. However,since patents are applied for before clinical trials begin, and clinical development can take on an average 5.8 years or more, the effective life of a patent once the drug is approved is usually only a few remaining years. Protecting a branded drug by patent regulation is a means of ensuring appropriate compensation for the immense costs of drug discovery. Following 20 years of patent protection, generic versions of drugs can be produced and marketed by other manufacturers. Because brand name drugs can take an average of 10–12 years and $100–500 million to develop, they are marketed at significantly higher prices than their generic counterparts. Generic drugs can use preclinical and clinical data from the previously approved branded drug for drug approval. The Hatch–Waxman Act of 1984 authorized the FDA to approve generic drugs without requiring them to repeat the same safety and efficacy clinical studies done by the innovator. The generic must only show bioequivalency. Analysis of the drug approval process and relevant legislation is included in this book as well as having been performed in previous works. Generic drug development involves several competing interests. Brand-name drug companies, generic drug companies, regulatory agencies, clinicians, pharmacists, third–party payers, and patients are all stakeholders with diverse opinions and objectives regarding generic drugs. Some brand-name drug manufacturers may aim to protect their patents by suggesting that generic drugs are not sufficiently equivalent. Generic drug manufacturers favor targeting drugs with presumed equal efficacy and safety for chronic diseases to secure a long-lasting and profitable investment.Federal and county agencies try to maintain fairness in the drug–manufacturing industry and above all ensure patient safety. Clinicians and pharmacists want to use their expertise and judgment in the selection of drugs.13 Patients desire access to safe, effective, and less-expensive medication. Thus, the generic drug industry involves several players with perspectives and motivations that may sometimes be at odds with one another. 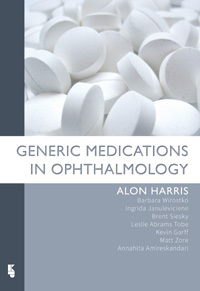 In this book, we present this history of generic drug development, FDA and European Medicines Agency (EMA) requirements for generic drug entry, a comparison of generic and branded drugs, concerns about generic ophthalmic drugs, and issues as well as perceptions regarding the clinical use and acceptance of generic drugs among the patients, prescribers, and pharmacists. 1 What is a Generic Drug?